Women’s League’s members’ abiding love for Israel and their passion for prayer are the inspirations for She Plants a Seed for the Future, Torah Fund’s newest special project. Student gabbai’im in the Women’s League Seminary Synagogue. Its gorgeous stained glass window and ark curtain represent ‘the bush that was not consumed’, the symbol of JTS. Rabbi Bradley Shavit-Artson has called the year of study in Israel for third year rabbinical students “the heart of the heart of our program.” Rabbi Artson, dean of the Ziegler School of Rabbinic Studies in Los Angeles, adds that “at the very core of our hearts is our love for the land of Israel, for the Israeli experiment in vibrant Jewish democracy.” Third year Ziegler students study with Israeli scholars and American olim at the Conservative Yeshivah in Jerusalem, where they are immersed in the Hebrew language and develop a fuller appreciation for Israeli culture and the challenges Israelis face. 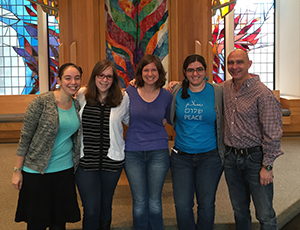 These future rabbis bring this love of Israel to their new leadership roles. On the east coast, Professor Arnold Eisen, chancellor of the Jewish Theological Seminary in New York, describes the Women’s League Seminary Synagogue (WLSS) as a space that is almost magical. He says, “I don’t know of a single space at JTS that is more of a builder of community than the Women’s League Seminary Synagogue.” Originally the JTS library, it was recreated as a prayer space through a Torah Fund Special Project in 1995. 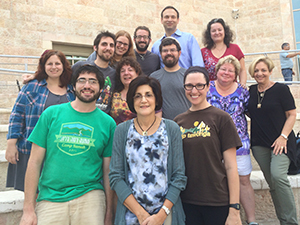 Students from the Ziegler School of Rabbinic Studies pose with Women’s League President Carol Simon (second row, right) and Torah Fund Chair Debbie Goldich (first row, center) in Jerusalem in October, 2015. Twenty years later, the spirit of prayer in WLSS is fresher than ever, with more singing than at any time in the history of the Seminary. There is experimentation with niggunim, words of inspiration, meditation, movement, and the visual arts. Future rabbis and cantors are learning to move hearts, minds and souls. Torah Fund is the dedicated philanthropic cause of Women’s League for Conservative Judaism, supporting higher level Conservative/Masorti Jewish education around the world. The She Plants a Tree for the Future initiative, launched in October 2015, supports the year in Israel for students at the Ziegler School, and the refurbishment and re-sanctification of the Women’s League Seminary Synagogue at JTS. As Torah Fund enters its 75th year, please join us and plant a seed for our future! Please tell me more about the ‘she plants a seed project. Can contributions be made? Is there a minimum ! Are there any other special projects that WLCJ doing for the students/residences? While the program is no longer active, you can find the information archived on the Members Only section of our site. Click “Log In” at the top right corner of the page. You should be able to find the relevant document.